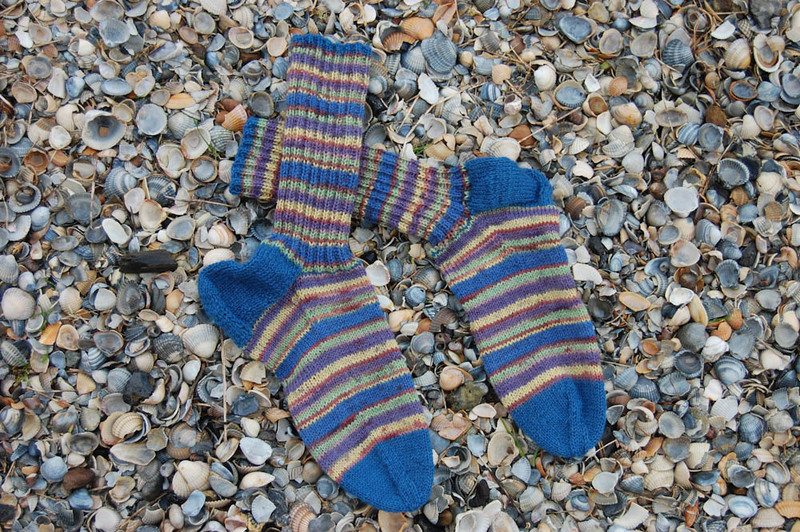 Knitting socks is easy to learn with the instructions in 7 detailed steps and many pictures. You can knit beautiful cloths, loops or even sweaters. But sock knitting is for you a book with seven seals? 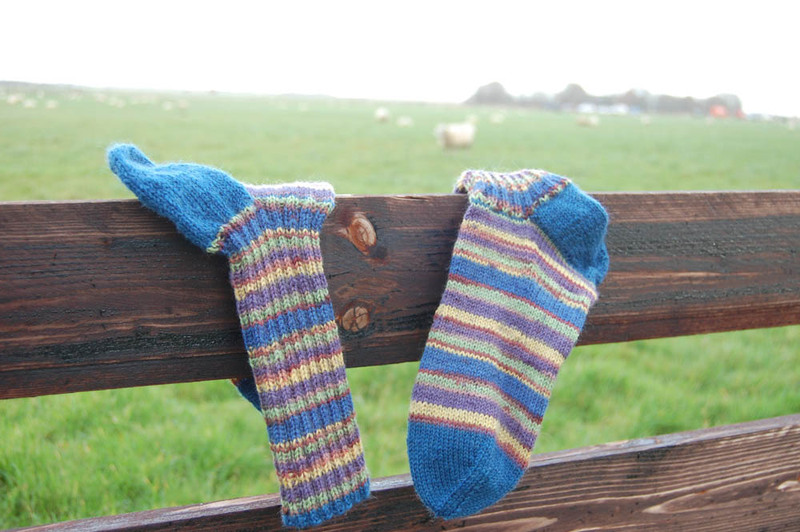 This does not have to be, because even knitted socks have many advantages. The material sheep wool has a temperature-compensating and heat-regulating effect. It can absorb up to 35% of its own weight without moisture. Sweat is thus absorbed by the wool. Wool also has the property of repelling the dirt, which eliminates frequent washing. Try it out and knit warm socks according to these instructions. What yarn for knitting socks? Special sock wool is used for knitting socks. It is particularly resilient. Mostly it consists of a woolen wool, which is added to 25% polyamide. If the wool portion has the designation “SUPERWASH”, the wool is not prone to felt during washing. The wool is offered not only in great individual colors, but also in interesting course yarns. The yarn is generally sold to a 50 g ball with a running length of 210 m. How much wool you need for your sock size, you can take the size chart. What needles for knitting socks? To knit the socks with this yarn, a needle size 2.5 is required. A total of approx. 90 g of sock wool is needed for the sample sock in size 43. For questions from some readers: For the use of the size chart you have to use a yarn 50g / 210m! 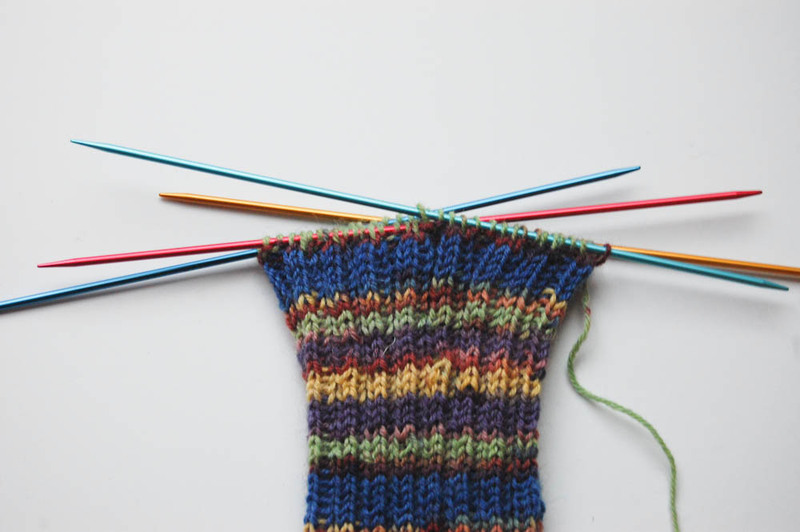 For knitting socks, a so-called needle game is used which consists of 5 needles. To stitch the stitches you need 2 needles. Place the two needles on top of each other and strike as many stitches as indicated in the size chart for the desired size. By taking the needles twice, the edge becomes beautifully loose. For the pattern sock in size 43, 64 stitches are applied. The stitched stitches are now spread over 4 single needles. You can see the number of stitches per needle in the table. The stitches are spread over 4 needles. 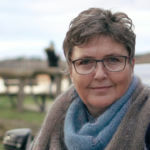 The cuff can be knitted over a height of 3 to 5 cm. You can work the shank with right stitches. 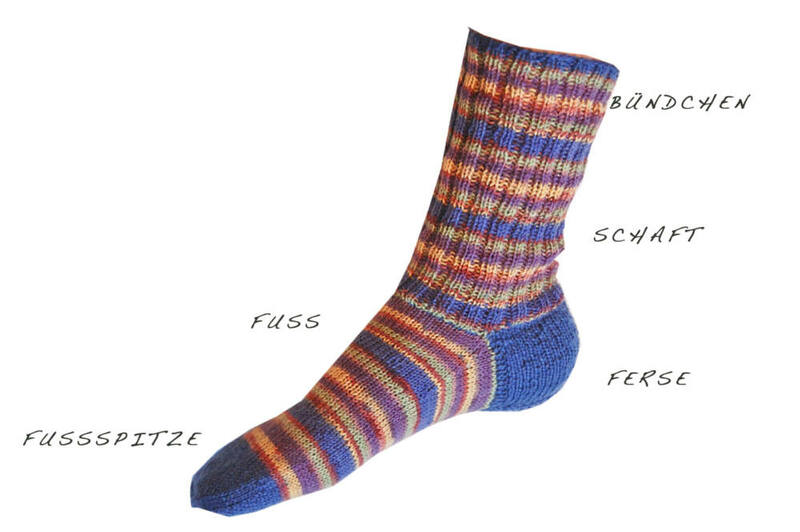 In our pattern sock, cuffs and shafts are made entirely from a change of two right and left stitches. Put the four needles into a square. Make sure that the stitches do not twist. The right side must point outwards with each needle. Now start with the fifth, the free needle, the first round to knit. Start with two right stitches, two left stitches, etc. until the first needle is knitted. Cuffs and shank are knitted in the cuff pattern 2 right / 2 left stitches. Now you take this free needle and knit the second needle in the cuff pattern. Thus, the third and fourth needles are also moved. Once you have knitted a needle, take this free needle to knit the stitches of the next needle. The round row is completed when the last stitch of the needle is knitted four. In the transition between the fourth and first needle, you should pull the thread tight so that there is no gap. It goes on in the Creep pattern. How long the shaft of the sock becomes, depends on the sock size. He also loves a sock with a long shaft, because he wants to turn it over again, the other prefer a short shaft. In our case the shaft has a length of 20 cm for a men’s stocking size 43. 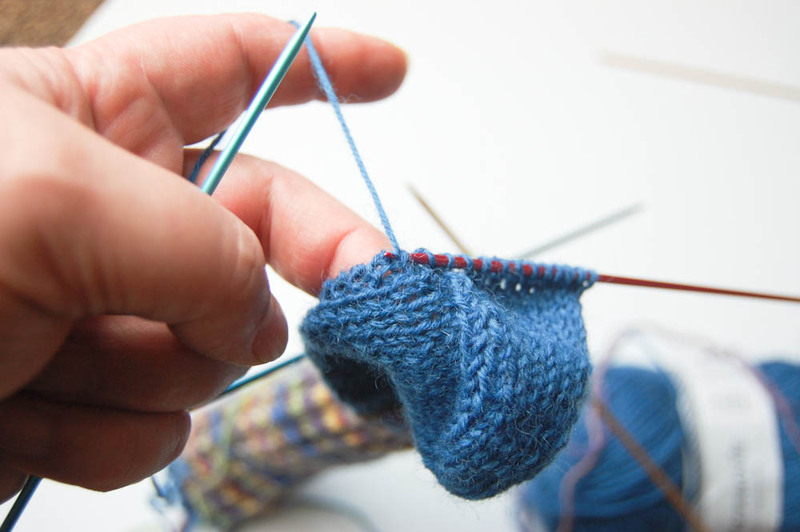 For the classic heel, the stitches of the second and third needles are shut down. The back of the heel is knitted from the stitches of the first and fourth needle in back and forth rows. 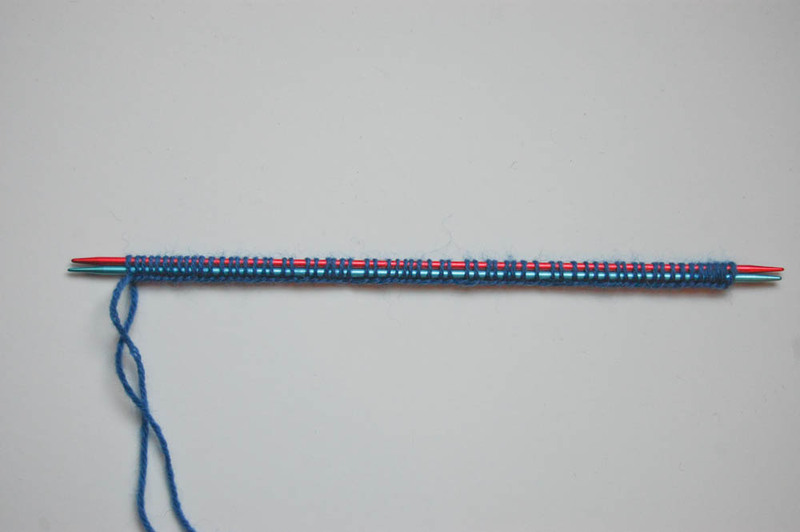 To do this, you can pull the stitches of the first and fourth needle onto a needle. The posterior wall of the heel is strengthened only by means of the first and fourth needle. How many rows are knitted for the heel back depends on the sock size. The number of rows is shown in the table. For the pattern sock in size 43, 30 rows are knitted for the back of the heel. Stitch right stitches in the row. In the back row two right stitches are worked first. Then follow up to two stitches before rows of left stitches. The last two stitches are again stitches. Thus, on the left and right margins of the heel back wall, a small area with ribs is created, which is helpful for the counting of the rows, but also useful for later meshing. 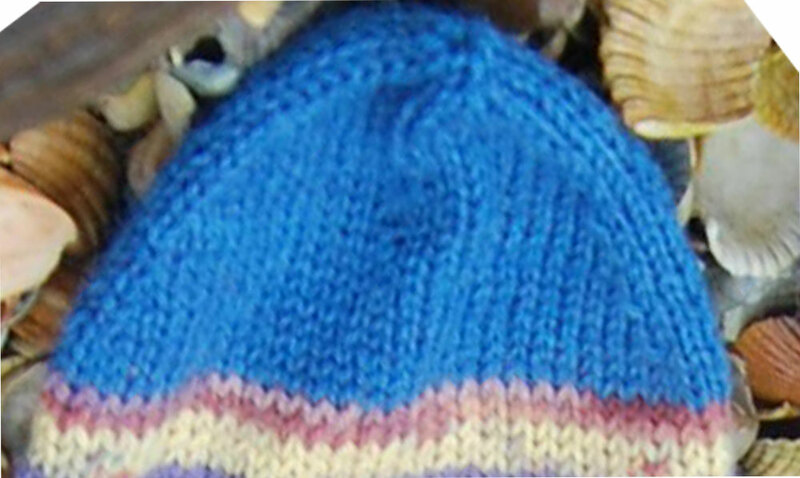 After all rows of the back of the heel are knitted, the cap follows. The heel loops are evenly distributed over 3 auxiliary needles (see table of dimensions). 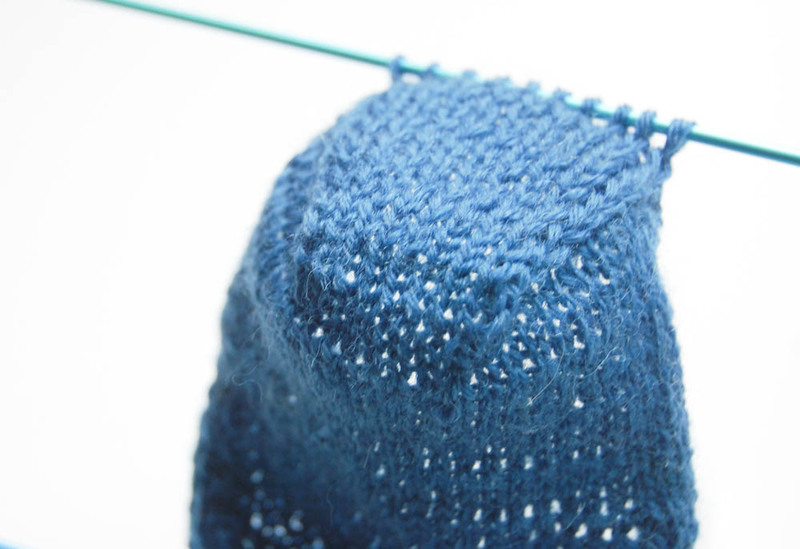 Spread the stitches of the back of the heel evenly on three auxiliary needles. For the pattern sock in size 43 the distribution of stitches is as follows: 11/10/11. 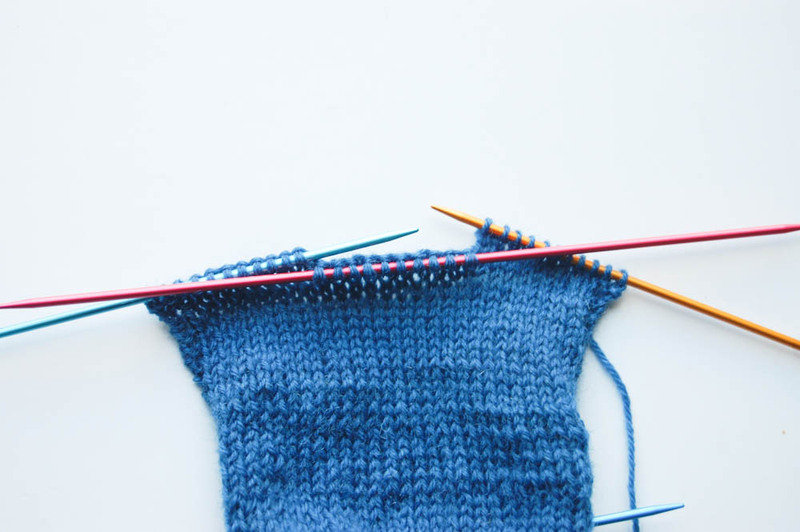 In the first row, knit the stitches of the first and second auxiliary needles on the right, * lift the last stitch of the second auxiliary needle on the right. The 1st stitch of the 3rd auxiliary needle knit to the right. Then pull the raised stitch over it. Turn the work. (The other stitches of the third auxiliary needle remain unprocessed on the needle.) Lift the first stitch on the left and knit the stitches of the second auxiliary needle on the left. The last stitch of the second needle you knit with the first stitch of the first auxiliary needle on the left. Turn the work. The first stitch is lifted to the left, the stitches of the second auxiliary needle are knitted on the right. Repeat the steps * until all stitches of the first and third auxiliary needles are exhausted. Your last row should be a row with right stitches. If this is not so, turn the work and knit a row with right stitches. These stitches are spread over two needles (needle 4 and 1). A stitch is worked out from each nod at the left edge of the back of the heel. To do this, use the 5th needle or a crochet needle to insert into the nape of the knot and pull the thread from the back to the front. This results in a loop that leads to the needle 1. Repeat this until you have formed a snare from each nod. Now take another stitch between the heel edge and the stitches of the second needle. Sew the stitched stitches of the second and third needle with right stitches. Take a single stitch with the fifth needle between the third needle and the right edge of the heel back. Then knit loops are formed from the nodules again as described and taken to the 5th stitch. Using the same needle, knit half of the stitches on the cap needle (needle 4). In the case of the sample size 43, 16 stitches are taken from the heel edge. On the needle one and four you now have more stitches than on the second and third needle. These are now removed in every third round. 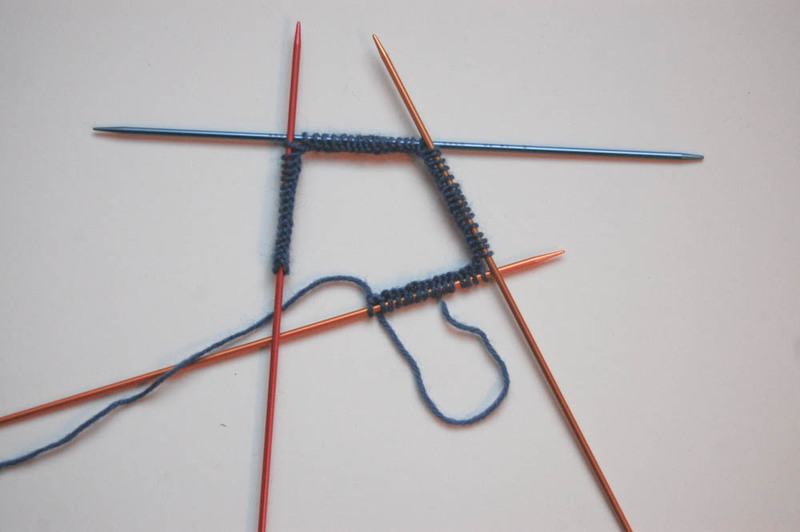 This creates a gusset, a triangle, which is important for the sock to sit comfortably at the foot. For the gusset you knit the second and third last stitch on the 1st needle in the 3rd round, on the 4th needle, knit the 1st stitch on the right, the second stitch on the right. The third stitch you knit on the right and pull the raised stitch over it. Repeat the declines so often until the first and fourth needles have the same number of stitches as on the needles two and three. For pattern size 43, on each side, 5 stitches are removed for the gusset in every 3rd round so that 16 stitches are placed on each needle. Decrees for the gusset in every third round. This creates a small triangle. 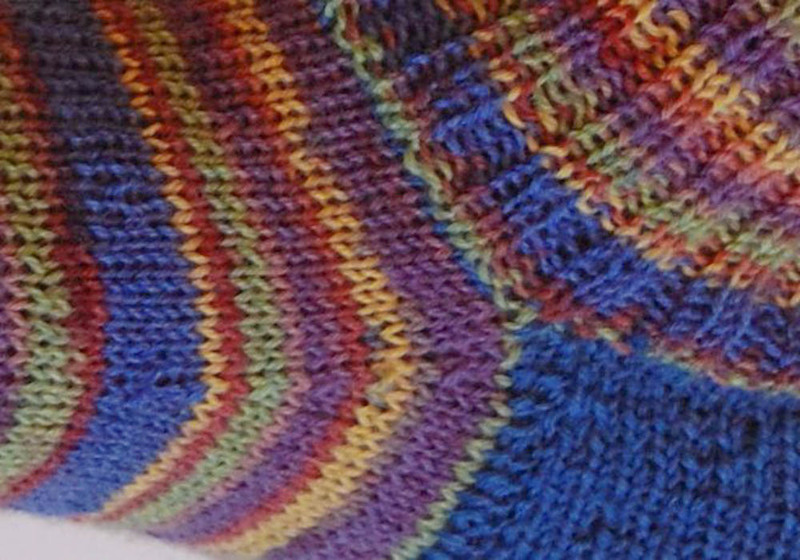 The foot is further knitted in loops with right stitches. 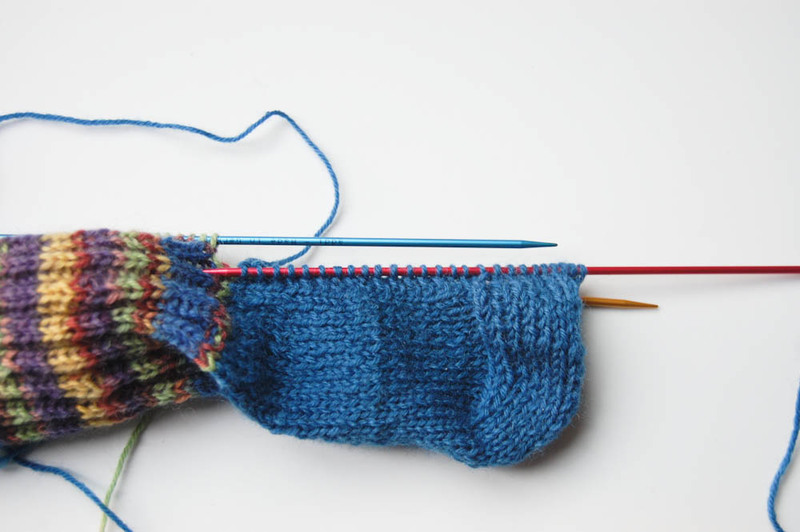 The size table indicates the number of centimeters including heel must be knitted before the tip can be started. 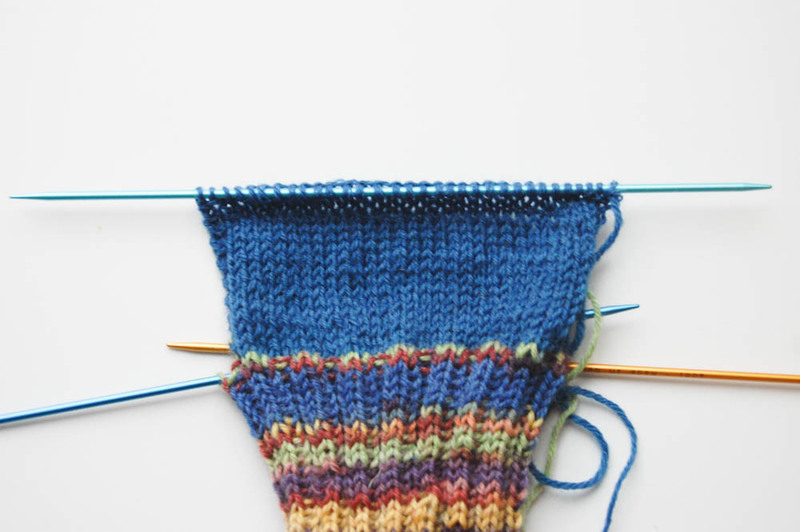 The tip starts with the pattern sock when the foot including the heel measures 22 cm in length. To make the top, knit the second and third last stitch of the 1st and 3rd needle together, the last stitch is knitted right again. The 1st stitch of the 2nd and 4th needle knit to the right, the 2nd stitch to the right, knit the 3rd stitch to the right and pull the stitch above. The maximum table provides information on how often the rounds are carried out according to the pattern described above. 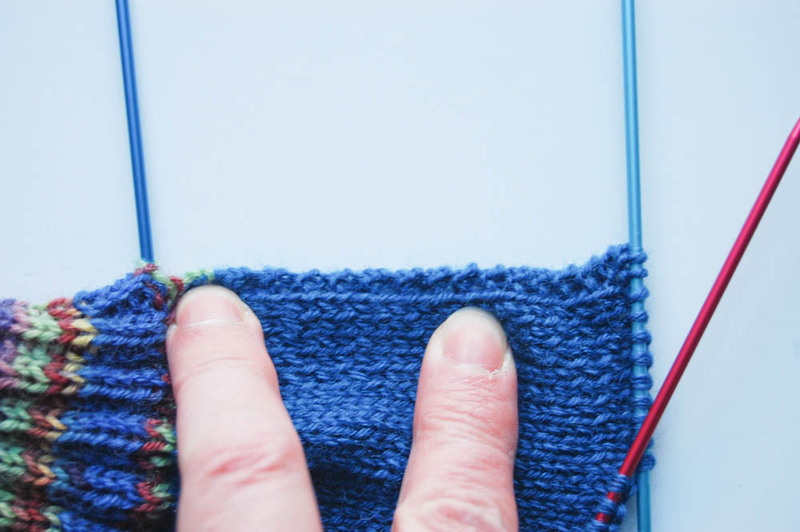 When only 8 stitches are left, pull the last knitted stitch through the remaining stitches. Cut the thread and pull it out of the last eyelet. Now you can sew it. And then in each round until a total of 8 stitches are placed on the needles. A sock is now ready. In the same way, you can knit the second sock.